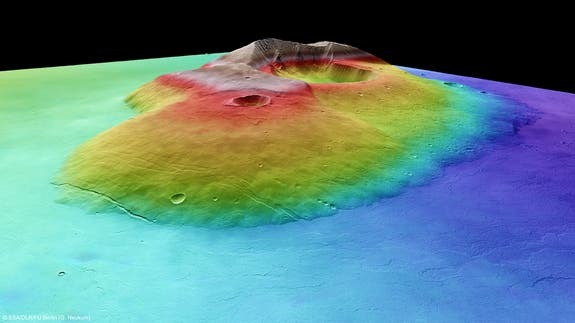 Tharsis Tholus, an extinct 4-billion year old Martian volcano soars 8 kilometres above the surrounding landscape – almost the height of Earth's Mount Everest. The image was created using a Digital Terrain Model (DTM) obtained from the High Resolution Stereo Camera on ESA's Mars Express spacecraft. Elevation data from the DTM is color-coded: Purple indicates the lowest lying regions and beige the highest. By comparison, rising above the Red Planets frequent dust storms is the Olympus Mons -the tallest known volcano and mountain in our solar system (image bottom of page). 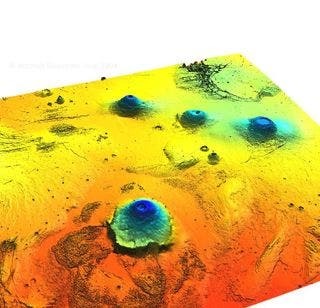 The central edifice of this shield volcano stands 27 kilometers ( 88,580 ft) high above the surface -or three times the elevation of Mount Everest above sea level and 2.6 times the height of Mauna Kea above its base. It is 550 km in width, flanked by steep cliffs, and has a caldera complex that is 85 km long, 60 km wide, and up to 3 km deep with six overlapping pit craters. Its outer edge is defined by an escarpment up to 6 km tall; unique among the shield volcanoes of the Red Planet. In 2004 the Express orbiter imaged old lava flows on the flanks of Olympus Mons. Based on crater size and frequency counts, the surface of this western scarp has been dated from 115 million years in age down to a region that is only 2 million years old -very recent in geological terms, suggesting that the mountain may yet have some ongoing volcanic activity. Mauna Kea on the Hawaiian Islands is an example of similar shield volcanoes on a smaller scale. 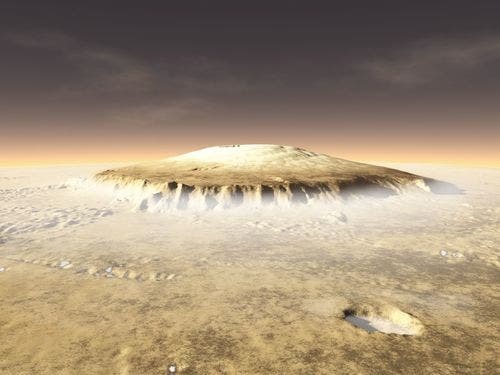 The extraordinary size of Olympus Mons is likely because does not have tectonic plates. Thus, the crust remained fixed over a hotspot and the volcano continued to discharge lava. The mountain, as well as a few other of the volcanoes in the Tharsis region, was visible from Earth to 19th century observers. The astronomer Patrick Moore points out that during dust storms, "Schiaparelli had found that his Nodus Gordis and Olympic Snow were almost the only features to be seen. But only with the Mariner probes could this be confirmed with certainty. After the Mariner 9 probe had photographed it from orbit in 1972, it became clear that the altitude was much greater than that of any mountain found on Earth, and the name was changed to Olympus Mons.